The months of April and May saw a meteoric rise of temperatures in Metro Manila. It was truly the height of Philippine summer- hot, sunny and humid. No amount of the strongest sunblock was able to protect my face from the strong rays of sunlight. The effect was a light case of "melasma" (skin pigmentation) that does not look too flattering. My young jeweler friend Angela Angeles recommended me to her friend Margaux Arambulo, Managing Director and Aesthetic Specialist, (who is also a Registered Nurse) of M SKIN CARE &Wellness Institute. 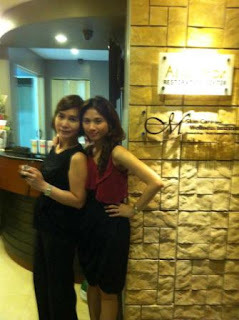 The Institute was founded by her mother, noted Dermatologist, Dr. Julieta Arambulo. During our exchange of emails, Ms. Arambulo gave me several options to address my problem. Her recommended treatments seemed effective so I decided to try them out. My dance trainer, international dance competitor and medalist, Ryan Jago, having the same problem as mine, also came along. Margaux, young and lovely,with the radiance of a woman who is about to be married, met us with open arms and introduced us to her fiance Michael Lucena, and her attending dermatologists, Dr. Michael Joseph Cruz and Dr. Nino Catambay. Her fiance, Mike for short, is the institute's business developer. 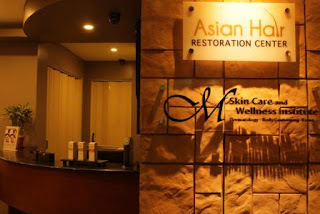 She explained to us that their M Skincare &Wellness Institute also specializes in hair transplant, with the latest technology available in the field. Aside from hair transplant, they have the latest skin care anti-aging treatments and non-invasive procedures to replace surgical face-lift, with almost the same results. They also do non- invasive Body Contouring through the latest Laser machines. 1. Photorejuve (IPL-intense pulse light) which delivers concentrated flashes of light to the skin for new collagen stimulation, thereby increasing the skin's elasticity, reducing fine lines, minimizing pore size, diminishing skin discolorations including facial veins and flushing redness of the face associated with Rosacea. This "quick fix" procedure requires no downtime to rejuvenate and restore the skin. A minimum of 5-6 treatments with an interval of 3 weeks is required for optimum results. I felt a certain tightness of the skin which made me look years younger, according to my friendly critics. 2. Customized peeling- Dr Michael recommended a French peel for my skin type. It is a buffered peeling solution with alpha hydroxy acids to exfoliate superficial dead skin cells for that dewy and glowing skin. I did not feel any stinging of the skin and my skin felt softer after. 3. 20% Vitamin C and silky caviar infusion via an oxygen spray gun to deliver the antioxidants into the dermis of the skin. My skin felt smooth and super moisturized for days on end, with not a hint of dryness. Ryan's treatment was slightly different from mine. He also had photorejuve and the 20% Vitamin infusion. The difference was the peeling treatment. Dr. Catambay, his attending dermatologist, recommended Diamond peeling for him. This is a non- invasive and pain free abrasion of the upper epidermal layer of the skin using diamond chips and small vacuums to reveal new skin that is radiant and smooth! Through the regeneration of the epidermal cell and structure, the skin's elasticity and collagen levels are improved and pores are minimized. One feels the difference immediately after this treatment without any downtime. Ryan also had deep intensive cleaning after his diamond peel. According to him his skin felt baby soft, smooth, and super moisturized. He also felt and looked 10 years younger! He will not think of going anywhere else for his skin treatments, he claims. 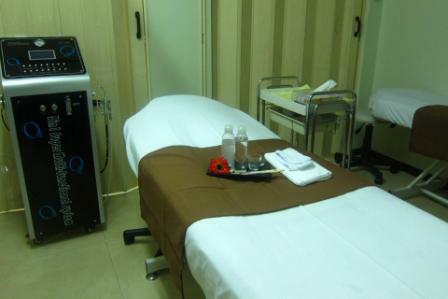 The friendly and courteous staff of the Institute adds to the inviting ambiance of the place. It will always be a pleasure for me to come back for my treatments with Dr. Michael Cruz and having a friendly chat with Ms. Margaux and her fiance, Mike. I am also looking forward to meeting Dr. Julieta Arambulo who was out of the country when I was there. 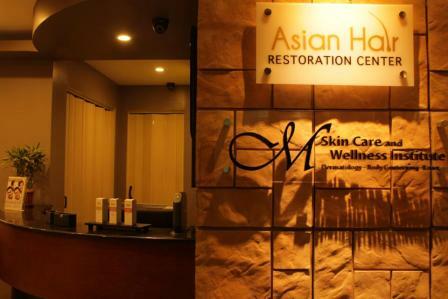 M SKIN Care is located at 1804 One San Miguel Building, Shaw Blvd. Corner San Miguel Ave., Ortigas Center, Pasig City. For inquires, call them at (02)703-1615 or (02)966-2281. The Certified Dermatologists of the Institute- Dr. Nino Catambay, and Dr. Michael Cruz with Ms. Margaux Arambulo, Managing Director and Aesthetic Specialist of M Skin Care and Wellness Institute.